These Stars of HOPE will be sent to Hurricane Harvey and Irma communities recovering from tragedy to lift spirits and to remind people they are not alone. 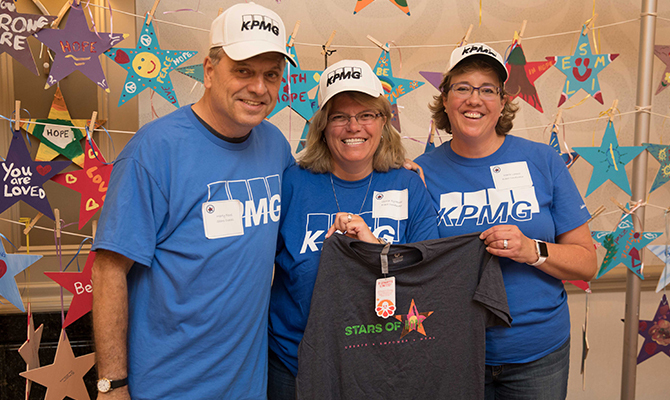 Stars of HOPE® was honored to be included in KPMG Global Services Centre (GSC) Day of Service that took place on 9.18.17 in Montvale, New Jersey. I, like so many of my KPMG colleagues that were involved in the Day of Service, am extremely proud to be a member of the KPMG GSC, the impact of the work done together that day and that the feedback has been so positive by everyone involved in the event.